The classic reference on weeds and invasive plants has been revised and updated. Focuses on the biological features of weeds and invasive plants, especially as they exist in agriculture, forests, rangelands, and natural ecosystems. Includes coverage of exotic invasive plants. 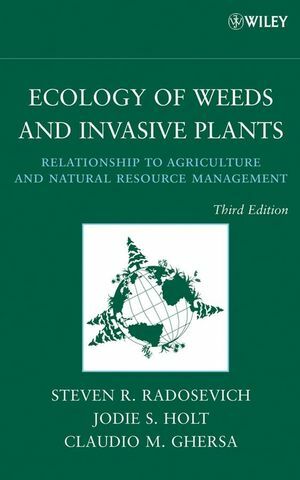 Discusses a variety of methods and tools for managing weeds and invasive plants, including physical, cultural, biological, and chemical approaches. Examines systems approaches for management, including modern Integrated Pest Management. Addresses future challenges for scientists, farmers, and land managers. This is the definitive, hands-on reference if you're a land manager or professional in plant sciences, agronomy, weed science, and horticulture. The book is also an excellent textbook for senior undergraduate or graduate students studying agriculture, ecology, natural resources management, environmental management, or related fields. Steven R. Radosevich, PHD, is a Professor of Forest Science, Graduate Program Coordinator in the Department of Forest Science, and an Adjunct Professor of Crop Science and Soil Science at Oregon State University. He is the author of Weed Ecology: Implications for Management, the first textbook on the ecology of weedy plants (now in its second edition) and over 100 scientific papers. Jodie S. Holt, PHD, is a Professor of Plant Physiology and Chair of the Department of Botany and Plant Sciences at the University of California, Riverside. She is the coauthor of the first two editions of this book and has authored numerous technical papers. Claudio M. Ghersa, PHD, is an Associate Professor of Ecology in the Department of Natural Resources and Environment at the University of Buenos Aires and Principal Researcher at the National Research Council (CONICET) in Argentina. He has contributed to or coauthored twelve books. In this third edition, the authors maintain the basic structure of the previous text but expand those topics to include exotic invasive plants of natural resource systems, as well as agriculture. The 3rd edition also provides different or additional examples from the prior book. There is a larger international component than in previous editions.